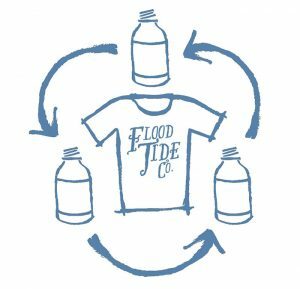 While already members of 1% For The Planet, Flood Tide Co. Apparel is now increasing their commitment to sustainability by switching performance blend t-shirts to Repreve recycled fabrics and all cotton t-shirts to U.S.A. grown cotton. We’re excited and proud of what’s to come, we hope you can join us in this endeavor. We’d love for you to take a moment and look at the Spring 2019 catalog and see what’s cooking! We are a group of individuals grounded in adventure that have an undying passion for the outdoors. While founded in fly fishing, we come from all walks of life but keep our motives simple: having a good time and living life to the fullest, while also leaving our tiny blue planet better than how we found it. Repreve transforms recycled bottles into an amazing fiber, used by the world’s leading brands to make athletic and fashion apparel and more. Their process embeds properties like wicking, adaptive warming and cooling, water repellency, and more at the fiber level for reliable, durable quality.